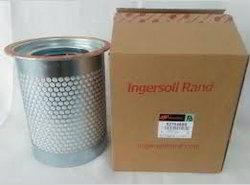 We supply original Ingersoll Rand air oil seperators. Running Model readily available. We emerged as one of the leading organization engaged in manufacturing Air Compressors, Gas Compressors and Vacuum Pumps. We are one of the well known vendors of major International & multinational groups in India. Our trading of Compressor Spare Parts has achieved some extra ordinary results in all over world. Only genuine, tested & efficient spares are supplied by us committing extra ordinary performance. Apart from this, we are also engaged in offering after sales and maintenance services for the same. Our list of products encompasses Air and Gas Compressors, Reciprocating Air Compressors, Gas Compressors, Vacuum Pumps and many more. We are appreciated in the market for undertaking any type of repairing, servicing and supply of genuine spares as well as services. Products that we offer to our clients are known in the market for their features such as high performance, easy to use and less power consumption with maximum life. Owing to our well built infrastructure, we are able to manufacture bulk order of our clients in the given time frame. This infrastructure is further equipped with all the latest types of tools and machinery that allow us in fabricating the flawless range of products. All these products are fabricated in our infrastructure under the guidance of our skilled professionals. Our professionals keep them in regular contact with our clients to know their exact needs and demands. For enhancing the quality of our products and to add some new products in our product line, we have separate R&D department.